– how and why it was made. On the first of May 2012, Keith Cooper opened a new exhibition of some of his architectural prints. 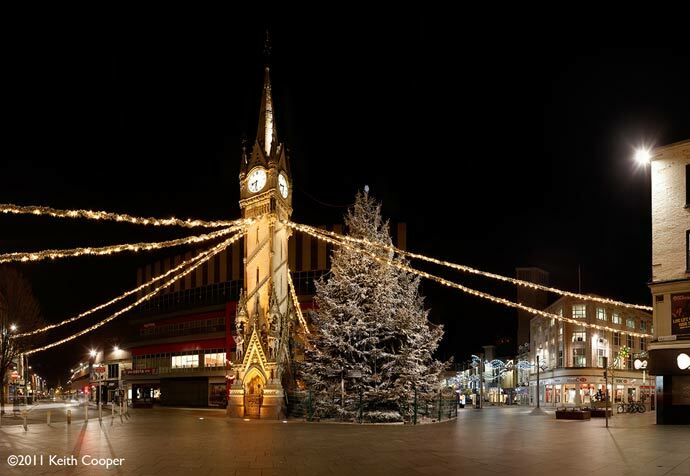 The photos are of his home city of Leicester in the UK, and reflect some of the history and architecture of a city that dates from Roman times. 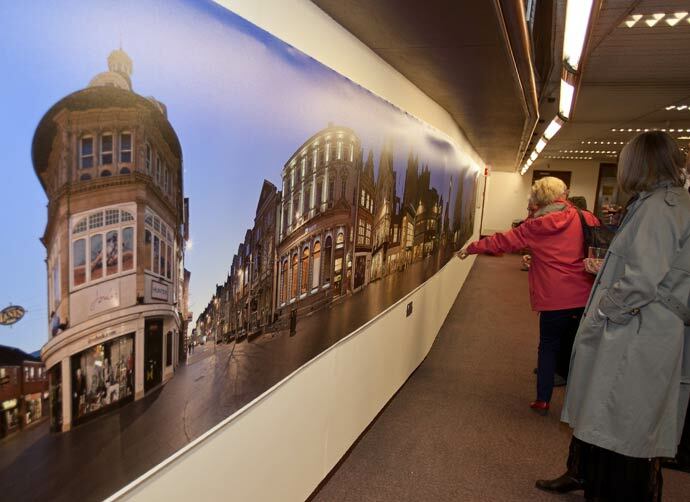 Centrepiece of the exhibition is a huge 14 metre (~47 feet) long print of the city centre at dusk. 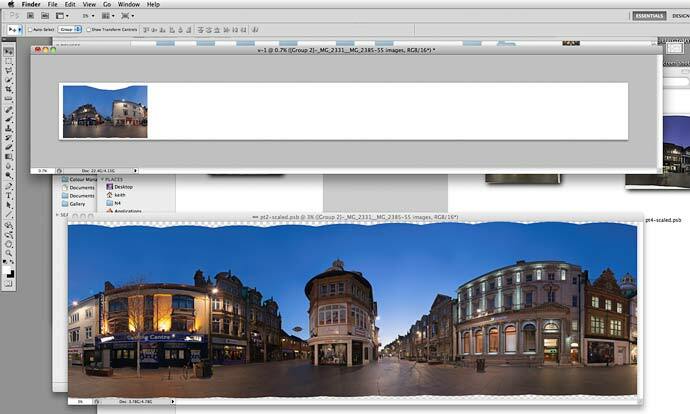 In this article Keith discusses some of the technical challenges in producing the image and the print, along with some of his reasons for choosing this way of depicting the scene. The exhibition information page has full details of all the large prints on show. As a landscape and architectural photographer I’m often faced with the challenge of depicting a large expansive scene as a photograph. I’ve acquired a collection of fine wide angle Canon lenses that give me a great deal of flexibility in recording scenes. The lenses range from the EF8-15 zoom fisheye, through the EF14 2.8L wide angle, to the TS-E 17mm and 24mmshift lenses. These lenses give me a variety of ways of creating a flat photographic image of the three dimensional scene in front of me. It’s this transformation, and the effects imposed through a particular lens choice, that to me reflects one of the key skills you need to acquire for effective use of wide angle lenses. 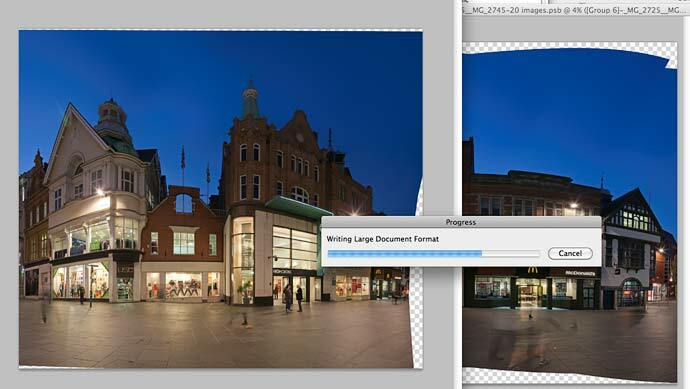 One additional tool, that has become easier to use in recent years, is stitching smaller images together. This allows the effective capture of images beyond the normal limits of existing lenses. I’ve used this technique myself in recent years, taking sets of images, when out and about, with the aim of stitching them together to get a wider view. The mountain lake in Colorado is stitched from 7 portrait oriented shots – taken hand held and cropped after stitching. 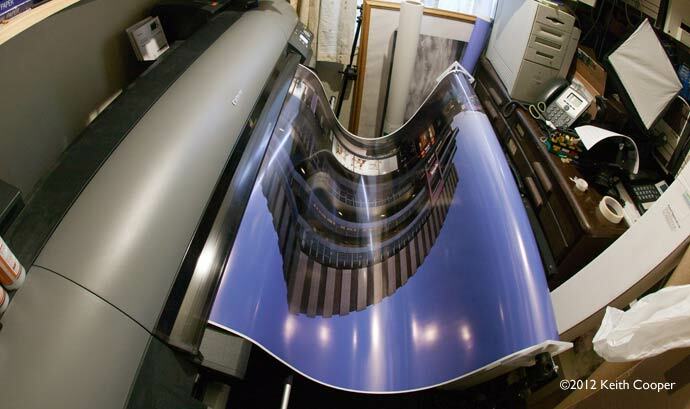 The multiple images also increase the resolution to a point where even a 2 metre long print of the image is very sharp. I’d note though, that this image has an aspect ratio of 2.7:1 – so the print is 2.7 times as long as it is high (18″ high would be 48″ long). This makes for expensive custom framing and mounting. What about using multiple rows of overlapping images to effectively add extra height to the wide shots? Well, I’ve experimented with this, and it quickly gets quite tricky to make sure you’ve got all the shots you need for a stitched image (you need overlap with all adjacent shots). Even with a specialist manual panoramic tripod head, it gets a bit cumbersome. 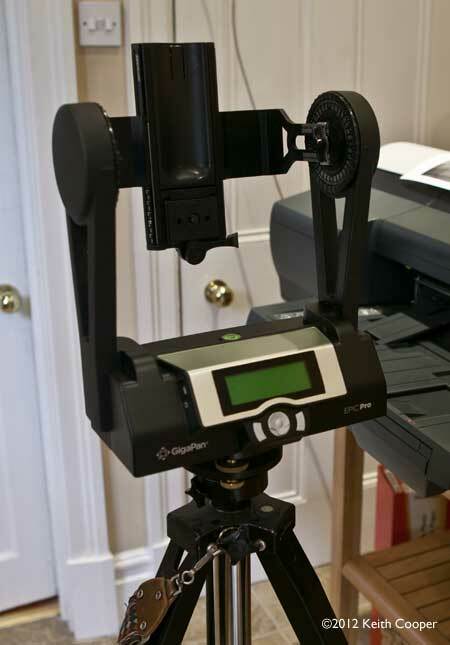 It was last autumn (2011) that I decided to get a motorised tripod head – the GigaPan Epic Pro. 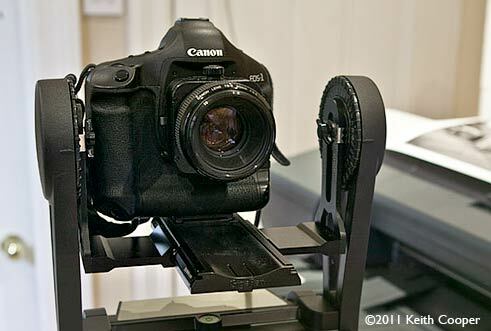 The device provides a motorised mount for your camera. It’s controlled via the buttons you can see below the display LCD to the right. The head is supplied with software that takes your set of overlapping images and handles all the calculations needed to stitch the images into a seamless whole. The software works, but I found it a little limited in output options. It also includes functionality to enable sharing and web viewing of the huge images that you can create. I’ll be honest and say that sharing and web viewing are very low down on my list of reasons to get the GigaPan – I wanted it to simplify the mechanics of taking photos covering a wide area, that I would then use much as I would, any other high res file out of my camera. It was during researching uses of the GigaPan, that I realised that a lot of examples of wide panoramic images, especially those in the ‘Gigapixel’ category, were actually not that interesting as photos. It’s almost as if lots of panoramic photos were of the ‘because I can’ category, rather than being taken for any meaningful content. Almost “Never mind the subject – look at all this detail”. 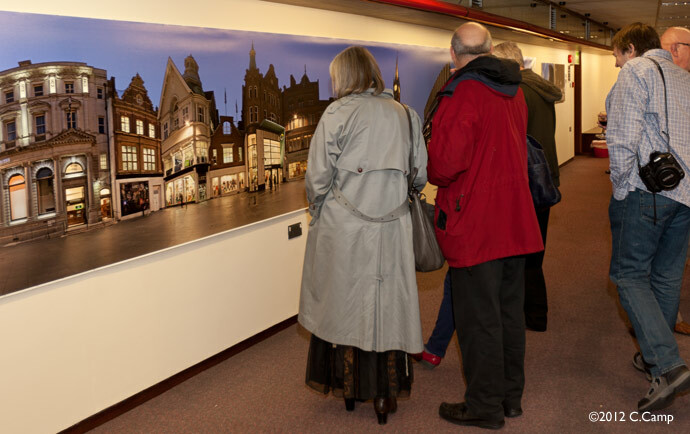 Last November (2011) I was invited to the 80th birthday exhibition of Michael Westmoreland at the Leicester People’s Photography Gallery – the same place that the 14 metre print is on show. Michael’s pioneering work in panoramic photography made me realise just how much he’d achieved in pre-digital times. Indeed I was struck by how much more impressive some of his images might be, if the negatives (many feet long) could be scanned and reproduced in the modern digital darkroom. I’ve been making large prints since I first got the 9600, including a 78 inch width version of the Suffolk beach image on the front page of this site. If you know this site at all, then you may have seen my many reviews of colour management and printing equipment, and software. During this time I’ve learnt a lot about what works visually for prints at different sizes and resolutions. In thinking about a potential exhibition at the LPPG, I looked at two main areas. Firstly, I decided that I wanted to make it local. The LPPG is a gallery for the people of Leicester and I wanted an exhibition that local people would enjoy. I live in the city by choice – I wanted to share some of what makes it interesting to me. Secondly, it had to be impressive from a technical point of view. I’m a commercial photographer and I do this sort of stuff for a living. As a professional photographer who doesn’t shoot weddings or do portraits, it’s often difficult to promote what you do. As I’ve written in several of our ‘Business of photography’ articles, there is no shortage of good photographers out there, you need a way of standing out from the crowd. 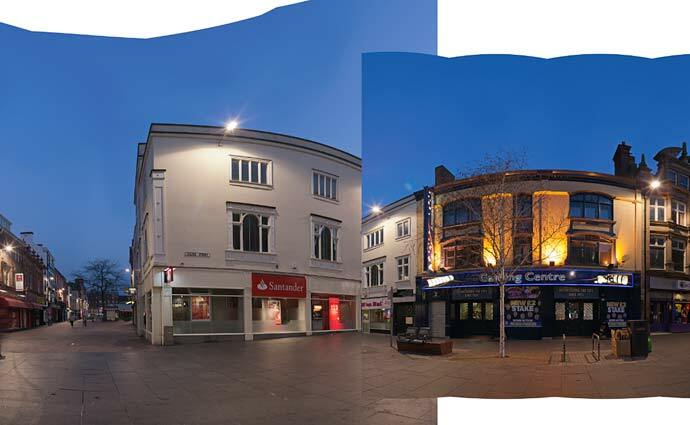 One initial experiment with the GigaPan was in the city centre at night, just before Christmas. It’s not that much different from what I could get with a lens such as the TS-E17 shift lens, but contains vastly more detail. 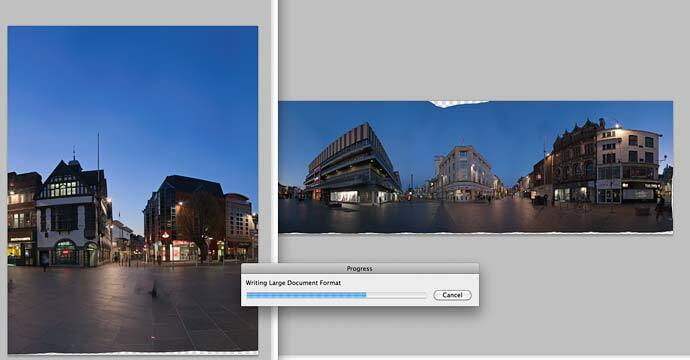 Not long afterwards I captured this view of De Montfort Square in Leicester [more info] which is actually on display in the current exhibition as a 60cm x 212 cm (24″x 90″) print. Important observations from this, included the fact that producing large stitched images really is much more like working with large format film, in terms of depth of field and approach to image composition. The building at the far right in the photo above is the leftmost white building in the view below. 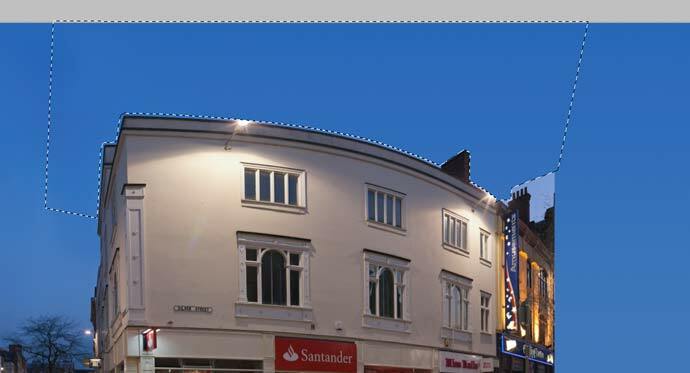 This is the Belmont in New Walk in Leicester, it’s the hotel where I was married in 2010. Since New Walk is relatively narrow, I’m getting the typical curvature of horizontals that you get in a wide cylindrical projection, if you have much vertical extent to your image. This particular software handles multiple images and panoramas with such ease of use and efficiency that I quickly settled on it as my image stitching tool of choice. It was seeing the overlap between the two images above (and another taken a bit further up New Walk) that first started me thinking of what you could show with multiple shots like this. Could the change of viewpoint be used to give the sense of movement to the viewer? 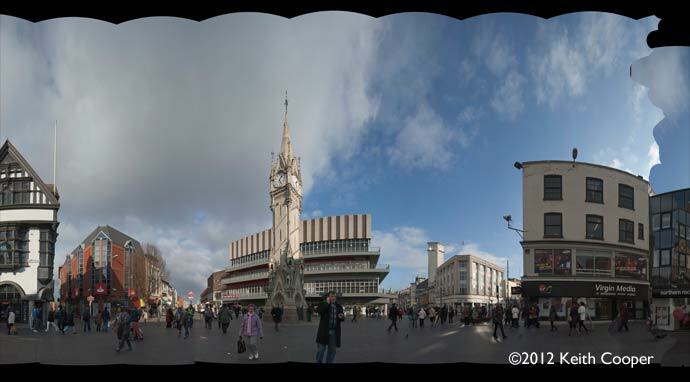 After a walk through Leicester city centre (actually on the way to the gallery, to discuss the exhibition), I decided to try a few test panoramic sequences. The first test was made from a series of stitched image panoramas, taken at slightly different locations, shot with a 14mm lens (portrait orientation). The camera is level and I just rotated as I took shots hand held. There are parts of 5 panoramic shots in this image. I realised that by making use of the joins between building, it was possible to link parts of panoramas. I also discovered, after making a 40″ wide print, that most people didn’t notice the joins. 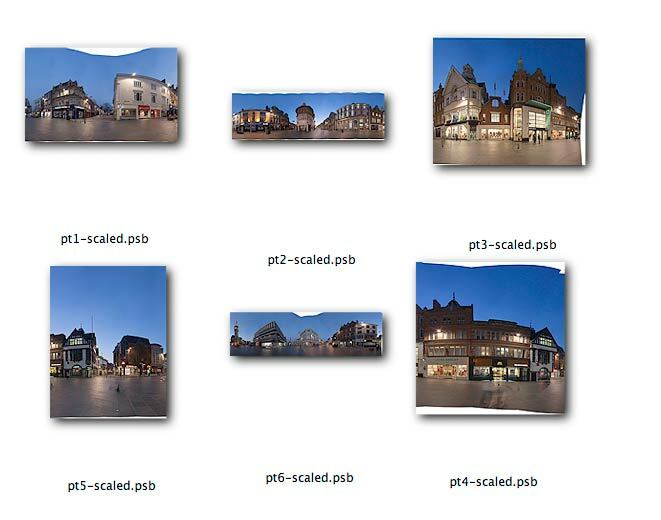 Next I went into town with a manual panoramic head (Manfrotto 303sph) and took many different panoramic sequences with a 17mm shift lens. The solid black part of the image below is an artefact of the tricks needed to stitch shifted images, and is described in more detail in my Autopano Giga review. Here’s a second attempt at a full panoramic sequence photograph, using many different parts, and looking at how you can take your change of viewpoints around corners. A detail of the test image showing that the size of buildings/objects such as the clock tower are very dependent on your location. I also realised that blending the sky was going to be a complex issue if I wanted to print the image at a very large size. This was the point where I confidently told the gallery that the exhibition would feature a print around fifty feet long and 44″ high. In capturing the images for the panorama segments, I needed to choose which lens to use. A longer focal length produces more image detail, but would take longer to produce the shot. A wider lens would be quicker, but the resultant image might lack detail at the size I wanted. Having decided that the print would be at least 300ppi resolution, I settled on the Canon EF50/1.4 lens – actually at around £300, my cheapest lens. However, at f/8 and using the geometry and vignetting correction of Adobe Camera Raw for processing my RAW files into 16 bit TIFF files, it performs extremely well. With several days of good weather forecast, I decided to shoot at dusk – well known as a great time for architectural photography, where there is still natural light, but at a similar level to usual building lighting. The camera used was my Canon 1Ds3 (21MP) at 100ISO, with 0.5 second exposures at f/8 for each shot. After processing the RAW files at identical settings (small amounts of highlight recovery and shadow fill added) into TIFF files, the sequences were imported into Autopano Giga. Note the slightly odd colour. This is because I’ve converted the files into the large ProPhoto colour space and Autopano ignores this during its processing. Why the large colour space? 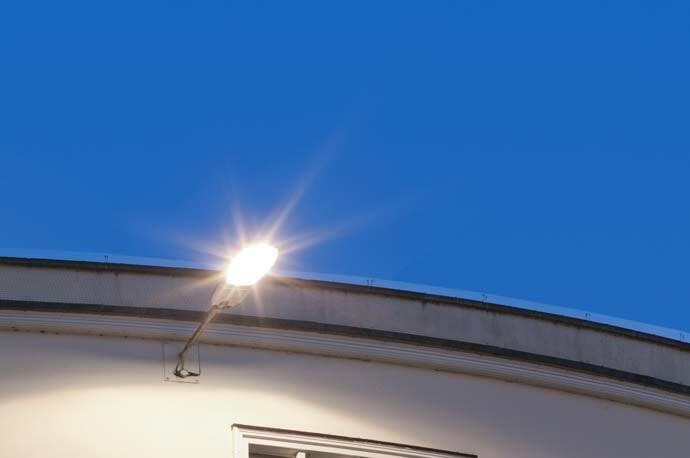 With the wide range of artificial lighting and strongly coloured sky, I want to keep the full range of colours in gamut. I know that my Canon iPF8300 can cover many of these deep red and blue colours with ease, and I’m also looking to minimise clipping of any channel. I know that if I’d worked in Adobe98, not many areas of the image would show any problems, but the extra ‘room’ in working in ProPhoto at 16 bit was a benefit without any obvious downside – in this particular image. The overall look of each sequence is very dependent on where the camera is located. Moving it only a few feet easily alters the relative heights of buildings. Autopano Giga makes excellent use of all the (effective) processors in my Mac Pro, as shown by this activity monitor screen grab. All 16 cores are working pretty much flat out. Eventually I had a series of stitched panoramas, which I could then place in order to make the full size panoramic sequence photo. However, this is the point where automation stops. Each segment needs to join along some naturally occurring seam. Due to where the seams occur in the segment, they may not actually be the same height (in pixels ) in different segments. This is where taking the images at higher resolution than strictly needed is of benefit. Where there is a seam, I’d measure the height in pixels in each segment of an object at the seam. If for example a wall is 6900 pixels high in one segment and only 6100 in the segment that it is to be matched to, then one or both values need changing. Fortunately, with the cylindrical projection I’ve used, transforming the image (Photoshop transform>warp) is quite easy with the adjustment splines, you can see below. Deciding which images to bend and which ones to leave, is very much a judgement to make, based on how the physical buildings are arranged and how you want to flow one panoramic segment into the next. This really is the bit where your own skill and judgement is what counts. This is the bit that sets a large part of how the final print will feel as people walk along it. The large amount of detail in the image is deliberate – it’s there to draw the viewer in, to give the feeling that there is more to be seen, new secrets to be found. 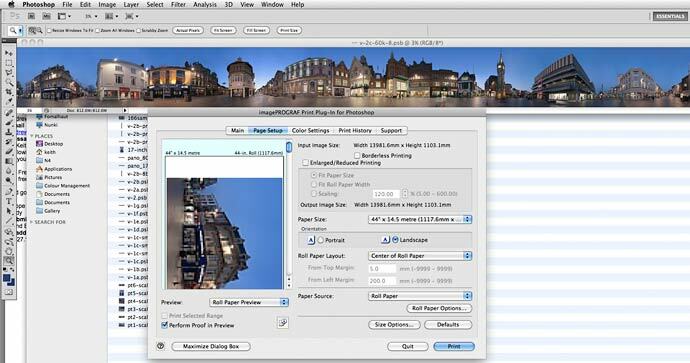 Large images are usually pretty low on detail – they are meant to be viewed from a distance. This one is meant to be viewed at a distance -and- up close. Eventually I ended up with six files (note the .psb file extension) and saved scaled (warped) versions of each. At this stage I’ve carried out no colour or brightness correction – so far it’s been about image geometry and composition. I’ve next created a very big empty document, and then placed each layer onto it. No need for any precise cutouts at this stage, since the warping process means that everything will match eventually. With two layers in place, I’m already appreciating the fact that I’m using Photoshop CS5 in 64 bit mode and with 24GB of RAM in my computer. This detail shows the placing of the second layer. I also made sure there was some 400GB of free space on my Photoshop scratch drive. Regular saving of work is always important, but when working with lots of layers and a 23GB file, expect the save progress bar to hang around for enough time to make coffee and have a bit of a read of the paper. The files are all in ‘large document format’ – 16 bit working and a file some 170k pixels wide are just going to slow things down. One issue with any long exposure shot, and especially a composite image like this, is what to do about people wandering into the frame. There is a pause function on the GigaPan, which will pause the capture process and then you can start again with a new shot at the same point. If you look at the images above you can see more distant relatively stationary people and a few ‘ghosts’ of closer ones. I’ve got ‘clean’ versions of many of these parts of the image, but despite my usual instinct to ‘remove’ inconvenient people from architectural shots, I decided that the ghosts gave a sense of movement to the scene that complemented the movement you get from the changing viewpoints. Comments I’ve received from visitors to the exhibition have been favourable in this respect. With longer exposures, there would be even fewer signs of people, or if you look at the daylight test versions of the picture earlier, you can see how lots of people changes the whole feel of the image. As an aside, I’d note that when I do panoramic seascapes, I invariably shoot hand held and quite quickly. Steadily advancing waves can make for quite appreciable stitching errors. The first version of the assembled image wasn’t going to be long enough, so I went out and shot some more potential panoramic segments. Fortunately, with light activated street lights and clear skies, I was able to use the timing of the street lights to ensure equivalent lighting conditions over the three nights it took to get all the images I wanted. Suffice to say, I now know how I’d plan a similar sequence photograph, if a client wanted one! I’m now at a point where I have the image assembled, and a good feel for how it is going to look. I’ll not go into all the details of the adjustments that I made to the different sections, but the two main areas of concern were evenness of the sky and balancing the perceived brightness/contrast of each segment. I’m very aware of the fact that everyone has their own favourite approaches to achieving results in Photoshop. I use a lot of masked layers, others may prefer a different technique. 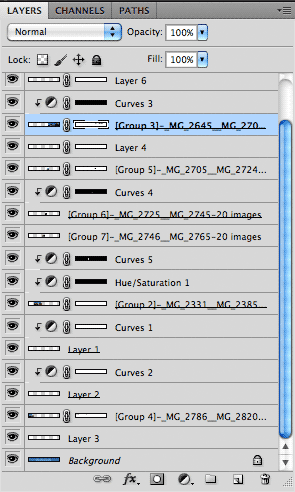 The main layers have adjustment layers, some of which are masked. I’ve balanced lighting at time of capture and in RAW processing, so most adjustments here are relatively minor. On a few occasions I’ve duplicated small parts of a segment to add back parts that have been erased as part of another process. Without covering click by click details it’s difficult to show all this, and I freely admit that I learnt new Photoshop techniques along the way. I worked a whole day on the first version of the image, only to go out that night, shoot some alternate segments and start again from scratch – the second version was simpler, quicker to produce, and looked a whole lot better. Getting an even, but accurate sky was very important – it helps tie the whole image together. If you’ve never done it before, take a sequence of images (camera on manual) just after sunset on a day where the sky is very clear. Take the photos around the full horizon if possible, but try and ensure that you get the direction the sun has set, and the opposite side of the sky. Now process the RAW files at identical settings and look carefully at how the colour varies from top of the picture to the horizon. Look too at the change in brightness, and if there are buildings around, how the different light from different directions illuminates them. The background layer to the whole image is a series of graduated fills, based on the actual sky, looking down some of the streets in the image. 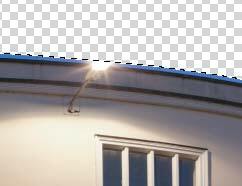 The example below, shows where I’ve cut away part of the sky at the Santander bank to show the graduated background layer, itself based on the ‘real’ sky to the left of the bank. If I turn off the background, you can see that there is the problem of what to do with the lamp and it’s flare rays. The important thing to note is that the lamp and rays are brighter than the sky. This means that if I cut out a chunk of image from the original layer, paste it in place and then brush in a mask with a lighten blending mode, then the flare rays will appear on the (background) sky. In the final image, this small layer also has an attached curve to fine tune the effect. There are lots of little bits around the picture like this. I’m sure if I did it again, it would be less complex, but that’s one of the benefits of learning more about Photoshop during the process. Move your mouse over the image to see the actual picture. Different parts are blended different amounts and in different ways, with the aim to use as much real sky as possible. Although not many show on the print, there are stars and planets visible, including a grouping of Venus, the crescent Moon and Jupiter. The foreground is taken up by uniform granite slabs, which lend themselves to the creation of seams by cutting in to the zig-zag patterns. Most people don’t notice the joins unless pointed out to them. Also present, are some small dust spots, from dust on the camera sensor – a final cleaning of these (healing brush) was carried out when the sky blending was finished. Like any work, there is a time to declare the picture editing finished, flatten all the layers and move on. Normally, with the iPF8300, I’ll use the Photoshop print plugin. It’s got some nifty features that I just find a lot easier to use than the normal Photoshop print dialogue. Unfortunately (as with many plugins), big files just won’t work – the export is greyed out. After a few experiments with some blank files, I discovered that the plugin has a file size limit of 60k pixels (no-one seems to have mentioned this anywhere before). So, to the normal Photoshop print dialogue. I’ve printed a few test strips from the image to check for colour and brightness. I’ve also added in various sharpening to the whole image, both at high radius (for contrast enhancement) and low radius (print sharpening). Each sharpening step used PS Smart sharpen on a duplicated layer, which is then masked in to where it’s needed. I was very careful to avoid ‘sharpening halos’ along the skyline – such halos are one of my biggest dislikes of the currently fashionable ‘HDR tonemapped look’. The last thing I wanted anyone thinking when looking at the print is that it’s HDR. All the component images are identical half second exposures. Get your lighting and exposure right and this is all you need. HDR software is now quite easy to use and in many examples I see, was entirely unnecessary if only the photographer had relied on good exposure and image editing skills. For printing the image, I’ve reduced the depth to 8 bit. I’ve also rotated it by 90 degrees, since the printer driver wasn’t happy with documents 166k pixels wide. In the printer driver, I’ve set everything as I would for a ‘high’ quality print. First of all I decided to try a print on the normal lustre paper I use for a lot of our prints. I’m not intending to make a full length print, I just want to see that it gets as far as the print coming out of the printers, and I’ll cancel it. I carry on, and some ten minutes later, the printer starts up. Looks good, so I let it run for a foot or so – it looks great. I’ve chosen to use a canvas for the print. The particular one I’m using is by Innova and is a polycotton blend with a glossy surface coating. The canvas is called Photo ultra glossy canvas (IFA36) and I actually wrote a short review of it several years ago. Normally I’m not a big fan of canvas prints, but this one has a surface coating and colour gamut that’s more like a heavy baryta type paper. I’m very much aware that this print has to be attached to a wall, and removed a month later. The heavy weight of this canvas hangs well. I’ve a 24″x60″ test print I made several years ago. This has been rolled and unrolled at numerous talks I’ve given, and shows no signs of wear. 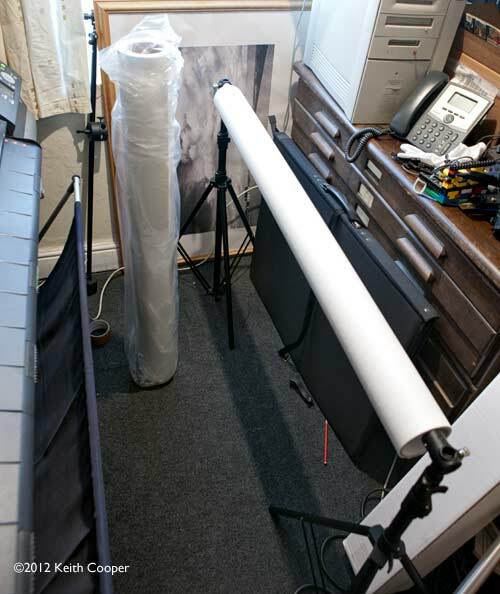 I load up a 15 metre roll of the canvas, ready to print the image. There is limited space in our print room, so I create a take up spool from an old paper core and backdrop stand. All is set up for making the big print. 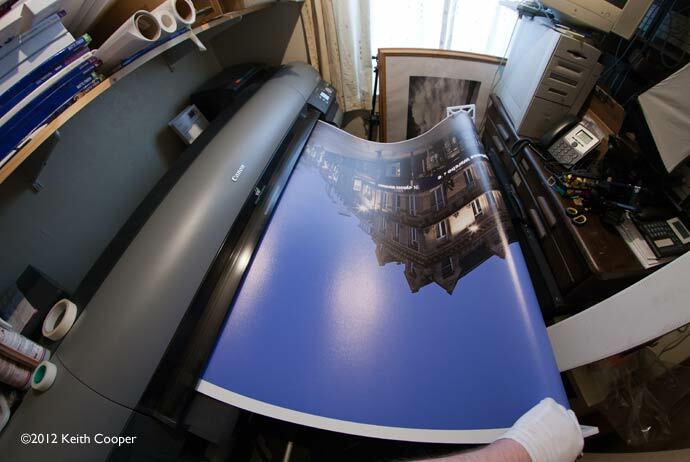 The print emerges at a steady rate – I estimate it will take about 3-4 hours to print the full 14 metres. After about an hour I note that the printer is slowing down, pausing for a few second every so often. Ten minutes later I hear it printing at full speed and go and check. I kill the print job, trim the print and notice that the crash occurred about 4 metres in to the print. After a lot of thought and searching, as far as I can I find on the web, no-one has printed at this size and resolution on an iPF8300. Canon UK were very helpful, but unable to come up with a workaround. No-one could say for certain that any particular RIP (printer driver software) would work either, and it was only a few weeks to the exhibition. First up I decided make use of the fact that the printer has a disk inside it. 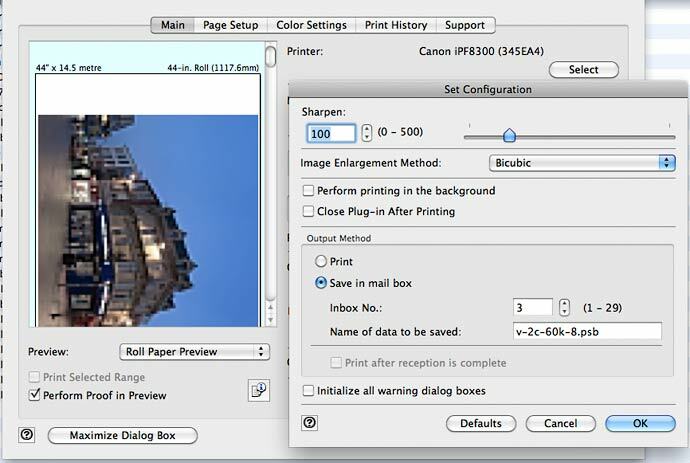 You can select to send print jobs to the printer only when completed, and then to store the print file on the printer for subsequent printing. My hope was that only a ‘good’ print file would make it to the printer. My first attempt was still processing after 24 hours, so I gave up on those settings. What about reducing the file size? 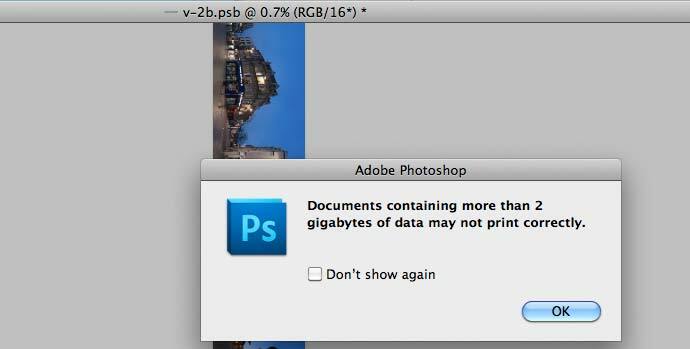 Taking the print resolution to 160ppi reduced the amount of data and eliminated the Photoshop warning. The driver fell over further into the print processing. After several days of wondering just what we’d ever get up on the wall, and with just two weeks to go, I reluctantly decided that the image would need to be resized to 60,000 pixels wide, down from 166,000. However, just what would it look like at only 108 pixels per inch? Would it lose the detail that was such an important part of the image? 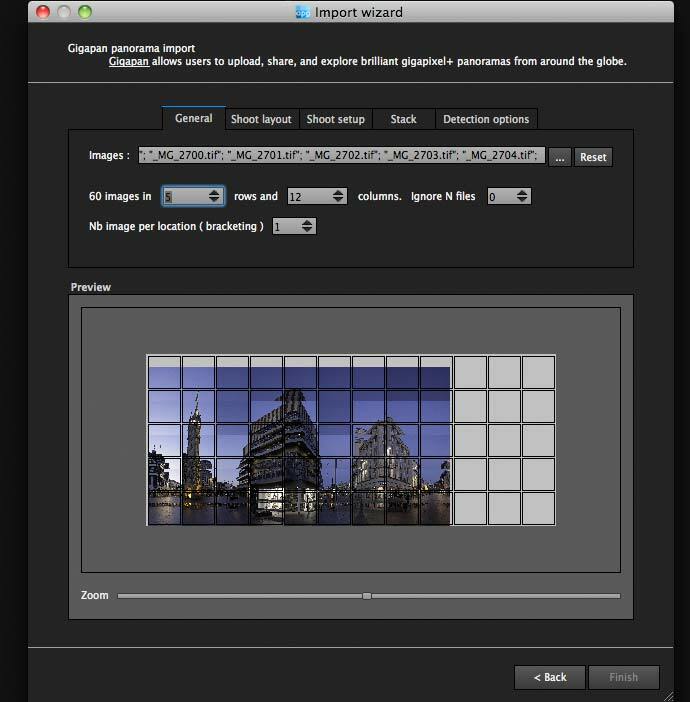 The reduced resolution image opens in the plugin with no problem. I try a few small sample prints and it looks surprisingly good. At this point, some of the features of the Photoshop print plugin really helped. The upshot of this, is that the print has very smooth lines and is showing very few of the artefacts you expect to see at such low resolution. It seems that all that detail in the original is not going to waste. 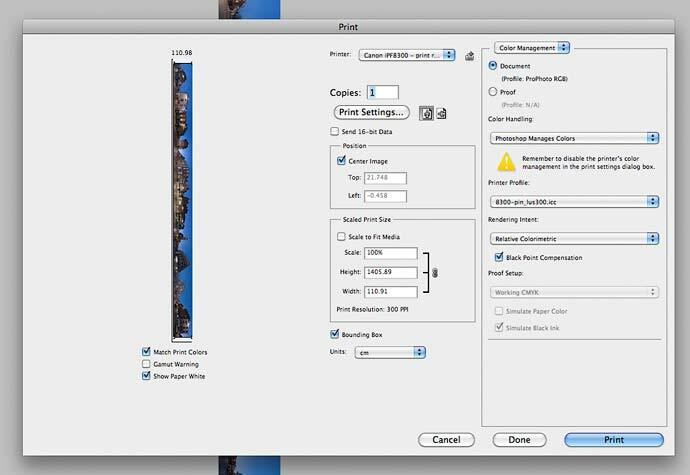 The image below, shows the print settings for the next big print test. I’ve got an spare 44″ roll of lustre paper sitting around, so I decide to do a full size test print (the paper was a sample, so this is only costing me ink). After an hour or so, the print file appeared on the printer. I loaded up paper, went to the printer and initiated printing directly from its control panel. Three and a quarter hours later, I have a perfect print. At this point we went down the pub… there -would- be a 14 metre print on the wall. The next day I repeated the process, but this time with a 15 metre roll of IFA36 Canvas and using a custom profile for the canvas I’ve previously built with X-rite’s i1Profiler software. The canvas print was then wound back onto its original tube and wrapped in tissue paper – 9 days before the exhibition opens. The large print used a total of 166ml of ink. I have to thank John and Ian of the gallery, for not only encouraging me to put the exhibition together, but all the thought that went into getting the print on the wall. In the end, thin battens of wood were screwed to the wall along the top edge. The print was then stapled through the border (~1cm) into the batten. The view here is with only a few staples in place before adjusting things to get it to be properly flat. John, from the LPPG, looks at all my ‘smaller’ prints that need mounting to the wall. The lighting is not ideal in the gallery and shows up slight unevenness in the hanging. At the opening, the following evening, some light battens have been attached to the bottom of the print and it’s much smoother. I’m in the picture, pointing out something to one of the guests. Have a look at the zoomified version of the image on the High resolution photography page. This is based on a 30,000 pixel version, as opposed to 60k in the print and 166k in the original ‘master’ file. Making this print has taught me an awful lot, in many different aspects of my photography. From a technical printmaking point of view I’m more comfortable in producing vast images that look good at a range of viewing distances. This benefits all my printing at whatever size. My Photoshop skills have improved – this feeds through into other areas of my professional work, both in what I can do and how efficiently I can do it. If you want to look at particular areas, I’d say effective use of masking, layers and blending modes. If you include the other high resolution stitched images in the show, I’m even more comfortable in using the GigaPan+Camera+lens combination as an effective large format camera with (equivalent) lenses that are just not possible with real optics. For normal panoramic photographs I’ve learnt more about aspects of composition and how to make a long thin image ‘work’ as a photo and as a print. The exhibition has been going for just a few days as I write this, and the reaction from the people of Leicester has been fantastic. It’s been on television and in the local press, and seems to have captured many people’s pride in the city. I’m personally most happy at the way the image ‘works’ in the way I’d envisioned, right from the first samples and tests. In particular, the smooth seamless sky seems to hide the joins from most people. I’ve been interested to see how many people couldn’t see any joins. At a distance it shows a whole scene, whilst as you walk into it and along it, it gives the feel of changing location and movement. Two people felt giddy as they walked along it.